The October Meeting of The Diabetic Kitchen will be held on Thursday, October 26, 017 in the Fellowship Hall of The First United Methodist Church which is located at 119 Jefferson Street in New Iberia, Louisiana beginning at 5:00 PM. 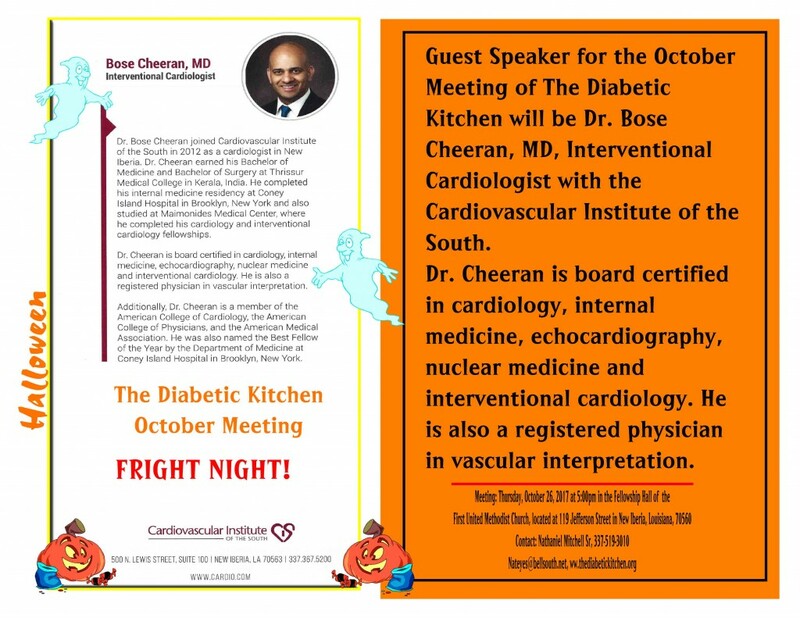 Guest Speaker for the evening will be Dr. Bose Cheeran, MD, Interventional Cardiologist. Dr. Dose Cheeran joined Cardiovascular Institute of the South in 2012 as a cardiologist in New Iberia. Dr. Cheeran earned his Bachelor of Surgery at Thrissur Medical College in Kerala, India. He completed his internal medicine residency at Coney Island Hospital in Brooklyn, New York and also studied at Maimonides Medical Center, where he completed his cardiology and interventional cardiology fellowships.